The Euro-India ICT Cooperation Initiative (EuroIndia) has been holding a series of events to foster cooperation between Europe and India in various ICT domains targeted under the 7th Framework Programme. ERCIM is a partner in this project. EuroIndia organized a series of well-attended brainstorming and information days in India in 2008. The project also participated in the ICT 2008 event in Lyon, with a networking session on research and innovation cooperation between EU and Indian stakeholders across a series of ICT themes ranging from technology development to innovative applications. The information booth welcomed a wide range of delegates. Most sought information on ICT research and innovation activities and players in India, while some wished to explore concrete cooperation opportunities in well-defined ICT thematic areas. January 2009 was an activity-packed month for the project, with three events organized in the last week of January in Mumbai and Delhi. On 20 January, an information day was held in Mumbai at the prestigious Indian Institute of Technology with about fifty participants, the majority hailing from academia/research. The Delhi information day, organized on the sidelines of the first EuroIndia International Conference (see below) saw close to forty participants, equally divided between academia/research and other categories (industry, government, NGOs etc). The aim of these sessions was to give participants a comprehensive understanding of the 7th Framework Programme (2007-2013), the ICT Work programme (2009-2010) and the upcoming Call 4, as well as providing information on how Indians can engage in research projects alongside European partners. The first EuroIndia International Conference took place on 22-23 January in New Delhi, in conjunction with the India R&D 2009: ICT Innovations conference organized by the Federation of Indian Chambers of Commerce and Industry (FICCI). The EuroIndia ICT cooperation session was attended by about 150 delegates spread across academia (30%), industry (45%), policy makers and public research labs (20%), and media (5%). EuroIndia made the most of a dedicated plenary session with Alvis Ancans from the International Relations Unit, DG Information Society & Media of the European Commission. In this session, a cross-section of players in Indian ICT research and innovation were given a complete picture of the ICT R&D organization, challenges, priorities and actions, instruments and funding. Sudhanshu Rai shared with the audience some of the results of the first module, which has analysed publicly reported innovation in the ICT domains in India over the past five years across the five regions and within broad thematic categories. While some of the findings fit general expectations regarding the concentration of ICT R&D/innovative activity and domains, others were hitherto unreported (see Figure 1). Figure 1: Share of publicly reported ICT innovation over 2003-2007 across regions of India. 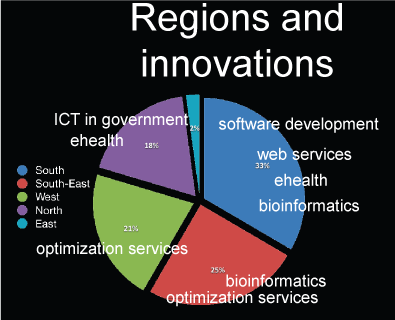 Leading domains of innovation in each region. He then presented the other three modules of this mapping exercise, which will be rolled out during 2009. The findings of the mapping will be presented at the second EuroIndia International Conference on ICT Innovations in India, scheduled for November/December 2009. The next EuroIndia event will be a Brainstorming Day to be organized in Paris on 27 May 2009 in conjunction with ERCIMs 20th anniversary meetings. The two aims of this event will be to present the methodology and findings to date of the Indian ICT knowledge and innovation mapping that is currently underway, and to engage the EU ICT research constituency in order to synchronize EU and Indian ICT research and innovation priorities and policies. The agenda and registration will soon be available on the EuroIndia and ERCIM Web sites. Participation will be by invitation only. If you would like to contribute to this session, please contact: info euroindia-ict.org. The Euro-India ICT Cooperation Initiative (EUROINDIA) is a Support Action under the Seventh Framework Programme coordinated by the Department of Informatics at the Copenhagen Business School. This initiative aims to reinforce collaborative research and innovation activities between Indians and Europeans in various ICT domains targeted under FP7. EuroIndia benefits from earlier groundbreaking work done under the BASIC (EuroIndia2004 Cooperation Forum on the Information Society) and MONSOON (http://www.euroindia-it.org) projects, which identified, profiled and engaged the widespread Indian ICT research community and helped increase Indian participation in FP6 and FP7 projects. ERCIM is a partner in the project.